The TrackGrip Ice Lug is a steel cleat/gripper that bolts onto the steel track shoe of excavators to increase and enhance equipment traction. Greater traction creates a safer operating environment depending upon the application, TrackGrip Ice Lugs can reduce the equipment and manpower required to perform the job. 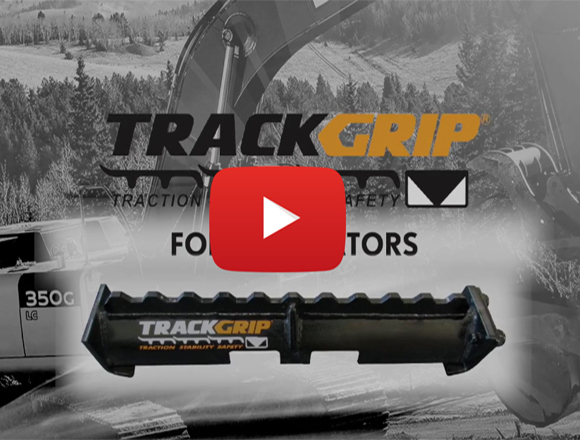 The TrackGrip Ice Lug patented design combined with high grade steel specifications and construction techniques ensures trouble free operation of equipment in the harshest of conditions. TrackGrip Cleat Ice Lug is designed for forestry, pipe laying, sandstone, mud, snow and ice applications. The exceptional sideways protection and deep penetrating lugs allow for increased productivity and safety. TrackGrip cleats are available for all standard steel track widths, ranging from 12 through 36 inch width steel tracks with all grouser combinations, no matter which manufacture. Manufactured from high grade steel, the TrackGrip Cleat designed for short term use, can be installed and removed within 30 minutes; this provides for the flexibility and operation of equipment in all weather and slope condtions. The TrackGrip Cleat is guaranteed not to come off the track shoe. TrackGrip Ice Lugs are available for all standard steel track widths, ranging from 12 through 36 inch width steel tracks with all grouser combinations. Manufactured from high grade steel, the TrackGrip steel ice lug designed for short term use, can be installed and removed within 30 minutes; this provides for the flexibility and operation of equipment in all weather and slope conditions. Fitting a set of TrackGrip cleats takes appoximately 15 minutes; a wrench is all required. Typically excavators weighing up to 16 tons are equipped with 16 track shoes; excavators larger than 16 tons are equipped with 20 to 22 track shoes(about every fifth shoe). The attachment hooks over one end snaps on the bolt through the locking pins. An increase in output per machine hour resulting in increased revenue per operation. Enhanced safety in the operation of the equipment. The resultant financial payback with the use of the TrackGrip Cleat Technology is immeasurable and satisfying. The TrackGrip Ice Lug is guaranteed not to come off the track shoe. TrackGrip Ice Lug attachments are 100% guaranteed for 6 months or 1000 hours of operation. Advantage of Being Able to Keep Working While Others Cannot. TrackGrip attachments are 100% guaranteed for 6 months or 1000 hours of operation. 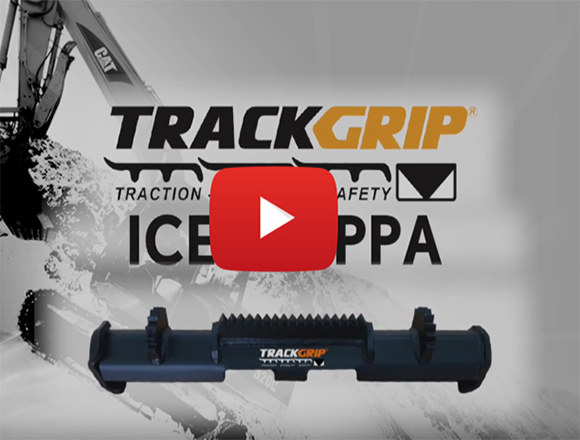 TrackGrip Ice Lug is designed to improve stability, traction, and increase safety within the limitations of the specifications of usage of the machine. Woodbridge Equipment urges caution and is not responsible for any consequences or damages arising from the fitted equipment being operated outside of the manufacturer’s safety guidelines or specifications. An increase in output per machine hour; increased revenue per operation. TrackGrip Ice Lug, saving time, saving money! Fitting a set of TrackGrip Ice Lugs takes approximately 15 minutes; a wrench is all required. Typically, excavators weighing up to 16 tons are equipped with 16 track shoes; excavators larger than 16 tons are equipped with 20 to 22 track shoes (about every fifth shoe). The attachment hooks over one end snaps on the bolt through the locking pins. Rest of the page should only show the six installation pictures.